The Tribune Tower is a classic Neo-Gothic building located at North Michigan Avenue in Chicago.It is the headquarters for the Chicago Tribune and the Tribune Company. It is also listed as a Chicago landmark. In 1922, the Chicago Tribune conducted an international design competition to adopt for its new headquarters. It was looking for the most beautiful and distinctive building in the world and offered a $ 50,000 prize for the eventual winner. The design committee received more than 260 entries from all over the world. Eventually, a Neo-Gothic building designed by New York architects Raymond Hood and John Mead Howells won first prize. Construction of the Tribune Tower started in 1923 and was completed in 1925. 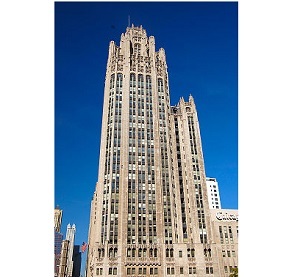 The Tribune Tower is a Neo-Gothic building that stands 462 feet or 141 meters. It has a total of 36 floors. The building is highlighted by its Gothic elements which are evident from the base of the building and at the top with its flying buttresses. The top is designed after the Rouen Cathedral in France which also has a crowned-shaped top and without a spire. The building also has gothic elements such as gargoyles, which were mostly the work of American artist and sculptor Rene Paul Chambellan along with the other building ornamentation. This includes the famous Aesop’s’ Screen seen over the main entrance doors of the building. Other notable carved images worth noting are images of Robin Hood and a howling dog, both of which are found near the main entrance. It was made to commemorate the architects who designed the building (Hood and Howells). The building is also famous for the reliefs found in the lowest levels of the building. The reliefs are noted because they contain a collection or rocks and building fragments coming from the different historically important sites from around the world. The correspondents of the Chicago Tribune brought each of the fragments from their travels worldwide. Each piece is labeled with its location or origin. There are 136 historical fragments currently located in the building.